After over a solid day of travel I reached my hotel in Hong Kong. 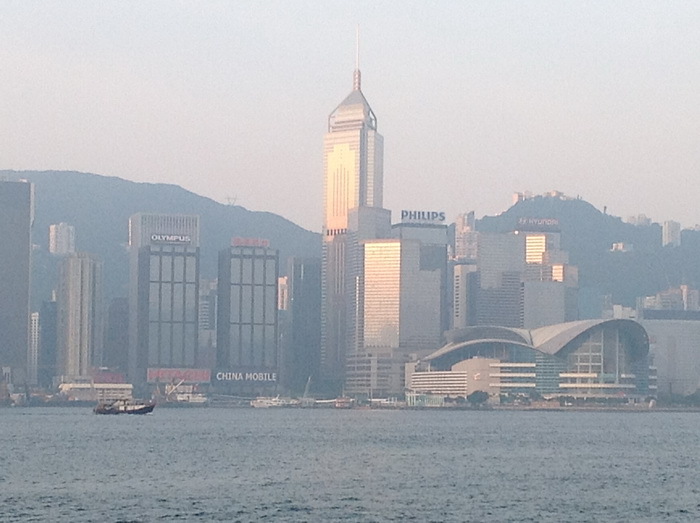 Unlike earlier trips I am staying on the Kowloon side of the harbor this time around . . . and it's dramatically different from staying on Hong Kong island itself. How is Kowloon different? Well, there are more tourists on this side of the harbor, and everything feels just a little more cramped and noisier than the Hong Kong side does. Yesterday I joined David and Kathy from GPI, and Patrick from the Hong Kong offices, for a ferry ride and a day in Macau, which, for those of you who don't know it, was once a manufacturing city (several of the knock-off and cheap transforming robot toys in my collection of bad eighties robots were made in Macau). Today, Macau is the "Vegas of Asia," with everything that implies being very, very true. On our walks through Macau, as well as on the ferry rides to and from the city, we reviewed the Ogre project. It was good to hear that the team in the Hong Kong office is excited about the game; it sounds like our Ogre Kickstarter project is attracting attention all around the world. We discussed options and ways to improve the game -- including an idea to make the finished game more "storage friendly," and those ideas were forwarded to Steve so that he could review options and present the new ideas to our Kickstarter backers. Today I'll be spending the afternoon and evening at the Hong Kong offices with the team that handles file processing and project costing, and basically acts as our point of contact with the factories in China. It will be a fun and productive day, but it is tomorrow's journey into China that I'm most excited (and nervous) about. Reportedly the drives will be long and painful, but the chance to see the factories was one I couldn't say no to.